Hey folks, I received copies of my new comic + sketchbook from the printers recently, and am anxious to offer them to those who can't get them directly from me at my comic con appearances. The interior pages are in black and white, 12 pages of comic story, and the rest comprised of custom commission art from 2014, all drawn by me. Cover to cover, 36 pages. At some point in the future, there will be enough material to fill a "Proton" volume, in full color. This story has been gestating for many years, and it has been fun to revisit my old notes and plot ideas as I create new pages. Feedback from fans has been positive, and the experience has gotten me excited to see this project completed. 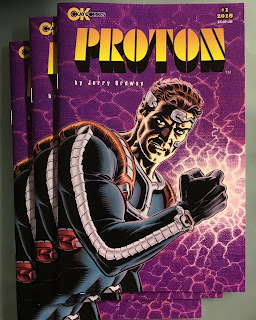 The lead story in this new comic is a continuation from my previous publication, The Messenger® issue #23, so I am offering the few copies I have here on this post via a "buy" button, for either the single issue, or as a combined bundle of Proton and the Messenger for one price. All character are Trademark and Copyright 2018 by Jerry Ordway. All rights reserved. Note: shipping rates for US and Canada only at this point, sorry.